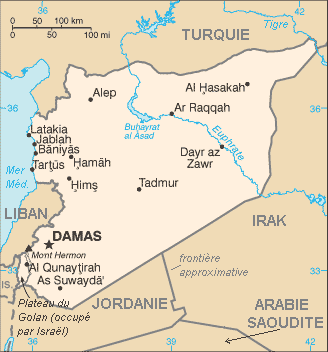 Syria : When and where to go? The best seasons to visit the country are spring and autumn thanks to the mild temperatures but also the beautiful light that prevail between the main seasons. Most European airlines fly to Damascus airport. You must have a visa, and your stay may not exceed 15 days, unless you renew it. The currency in circulation is the Syrian pound. The budget required for your daily expenses is fairly moderate: € 25 for a double room is usually enough and you can eat a decent meal for under €10. Transportation is generally quite inexpensive. There are no health problems that require a comment, but as always update your normal vaccinations, and if possible add those against typhoid and hepatitis A. Be careful with the water you drink and wash your fruit and vegetables. Protect yourself from the sun properly. Avoid traveling near the Iraqi border. For transportation within the country, buses are relatively cheap and many of them are quite comfortable, even luxurious. Some suggestions for those who wish to take home some souvenirs include wooden objects, damask fabric, dried fruit, chocolate, and marzipan sweets, Aleppo soap, blown glass, hookahs, keffiyeh and galabieh (djellaba).